Zachary worked on the Letter "D" this week. He has a great handle on his uppercase letters, and we're finding that he needs help with the lowercase letters - a big necessary if he tries to read, since obviously books are generally in lowercase. That gets to be rather frustrating for him. 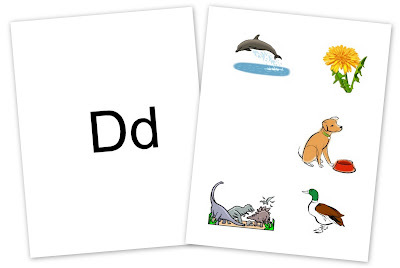 Here are some of the things we focused on with the letter "D". 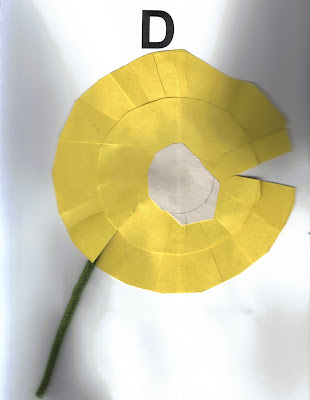 Our page for the letter “D” was a dandelion (apologies for the scan). This week we made paper donuts. For this craft you will need: a large pieceof paper, white glue, food coloring, paint brush, confetti or glitter. Mix a little food coloring in some white glue and put it in a small bowl. Click on thumbnail to download the pdf file. Philippians 2:14 - "Do everything without complaining or arguing." This week we practiced our letters on our tabletop whiteboard and easel that we have from Melissa and Doug (love that thing). And I ran right into a donut shop. And she said, "This nickel isn't good to me! There's a hole in the nickle, and it goes right through!" And I said, "There's a hole in my donut too! Thanks for the donut! Good day!"